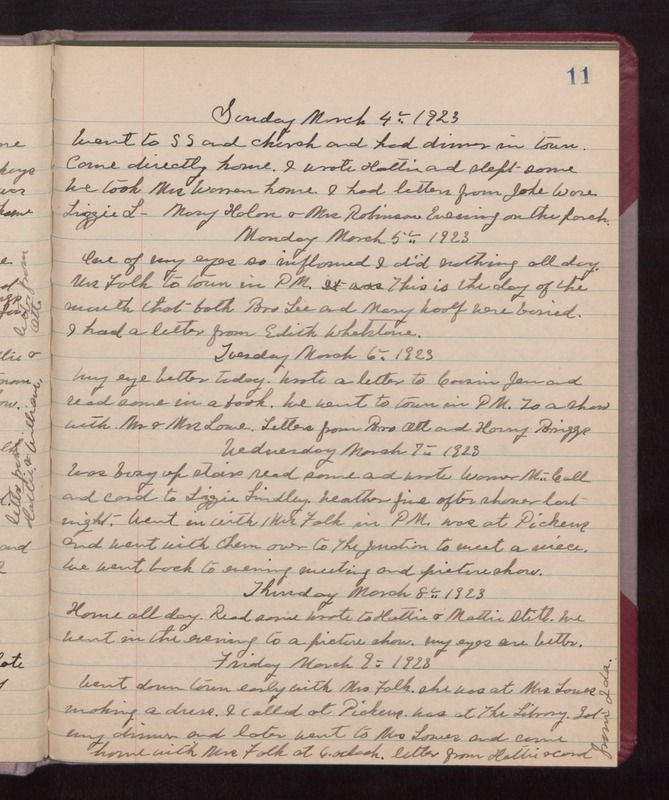 Sunday March 4th 1923 Went to SS and church and had dinner in town. Came directly home. I wrote Hattie and slept some. We took Mrs. Warren home. I had letters from Jake Ware, Lizzie L---. Mary Holon, & Mrs. Robinson Evening on the porch. Monday March 5th 1923 One of my eyes is so inflamed I did nothing all day. Mrs. Falk to town in PM. This is the day of the month that both Bro Lee and Mary Woolf were buried. I had a letter from Edith Whetstone. Tuesday March 6th 1923 My eye better today. Wrote a letter to Cousin Jen and read some in a book. We went to town in PM. To a show with Mr. & Mrs. Lowe. Letters from Bro Ott and Harry Briggs. Wednesday March 7th 1923 Was busy up stairs. Read some and wrote Warner McCall and card to Lizzie Lindley. Weather fine after shower last night. Went in with Mrs. Falk in PM. Was at Pickens and went with them over to The Junction to meet a niece. We went back to evening meeting and picture show. Thursday March 8th 1923 Home all day. Read some. Wrote to Hattie & Mattie Stitt. We went in the evening to a picture show. My eyes are better. Friday March 9th 1923 Went down town early with Mrs. Falk. She was at Mrs. Lowes making a dress. I called at Pickens. Was at The Library. Got my dinner and later went to Mrs. Lowes and came home with Mrs. Falk at 6 oclock. Letter from Hattie & card from Ida.